Well, the winning streak is over and Arsenal dropped points at home in Europe, but perhaps that was the better time to have a slight hangover from the Chelsea win than this weekend's league match would have been. Arsenal can still win their Champions League group on matchday five (November 23) with a win, at home, over Borussia Dortmund, coupled with Olympiacos taking at least a point at Marseille. Plausible! Arsenal must watch out for West Brom tomorrow, however, as this is the definition of a trap game. I think that phrase is just an Americanism, so I'll explain. Arsenal are coming off a huge win and could start thinking their season has turned a corner. They will have to avoid falling into the trap of looking past their opponents, in this case, West Bromwich Albion. These three points would count the same as the three Arsenal earned at Chelsea last week, so they cannot be taken for granted. For an example of the trap game effect, look at this fixture last season. Arsenal came out in a home game and played like they were just going through the motions, assuming three points were in the bag. Then, West Brom scored three in the second half to go up 3-0 and Arsenal could not claw back; they lost 3-2 in this match last September. Don't let this be a trap game. Please score three more tomorrow. Thanks in advance. It doesn't sound like there were any new injuries picked up during Arsenal's 0-0 midweek Champions League outing, at least as far as I know right now. The only injury news that's new we've heard lately is that Abou Diaby has had another set-back. After recovering from surgery on his ankle, he has now strained his hamstring... or his calf... and faces another three weeks out. Since May 1, 2006, when Dan Smith's horrendous two footed lunge snapped Diaby's ankle, that was the first of 28 different injuries he has experienced. That 28 doesn't include the fact that this injury is new and not to the ankle, so this is 29. 29! That's absurd. Arsene Wenger has stated that he's "worried" about the injury, but "not as worried" as he was three months ago. No word, at least as of the time on Thursday when I scheduled this to be posted on Friday at midnight, on Kieran Gibbs's abdominal injury, so I assume he is still too short. Marouane Chamakh is still suffering from his mysterious dropped-in-the-depth-chart/knee injury. Bacary Sagna is still out until December. Jack Wilshere is still on Twitter all the time/out until January. The legitimate selection questions come on the back four, as the fitness of the center halves is now outweighing the fitness of the fullbacks. It's great that you have people to cover for Gibbs and Sagna, but who goes where, and who gets a rest? Koscielny got the rest on Tuesday, so I it'll be either Mertesacker or Djourou to sit. Predicted XI: Szczesny, Djourou, Vermaelen, Koscielny, Santos, Song, Ramsey, Arteta, Walcott, Gervinho, van Persie. terrifying, man. Gunnersaurus should just eat them all. West Brom has lost to Manchester United and Chelsea this season, but both winning goals came on deflected strikes late in the match. The Baggies will hope to use the confidence that they've hung in tough games already this season, coupled with the fact that they won this fixture last year. Paul Scharner was removed just before the hour mark of West Brom's 2-0 loss to Liverpool last weekend. Albion have confirmed that Scharner has a grade one tear to his medial ligament. He's ruled out of this match and faces a fitness race to return in a fortnight against Bolton. Zoltan Gera, who joined West Brom on a free from Fulham (after previously leaving West Brom on a free to join Fulham three years earlier) has not played yet for the Baggies with an ankle injury. He could make his first appearance since playing for Fulham against Arsenal in the final game of last season, when he was shown the only red card Fulham received all season. Forward Shane Long is about halfway through a six week knee injury suffered in West Brom's 2-1 win over Aston Villa, after a "robust" challenge from Alan Hutton. 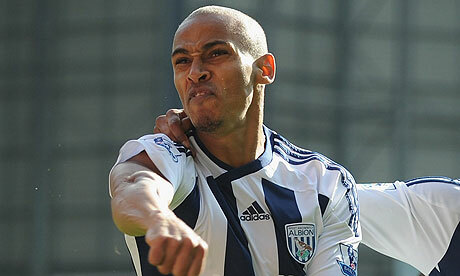 West Bromwich Albion are currently sitting 13th in the league table, with 11 points. They have, incidentally, picked up more points from their travels (seven) than at the Hawthorns (four) in an equal number of matches (five.) Before a 2-0 home loss to Liverpool last weekend, West Brom was unbeaten in four, having drawn two (0-0 to Fulham and 2-2 at Sunderland, where they blew a 2-0 lead) and won two against West Midlands rivals (2-0 over Wolves in the Black Country derby and 2-1 at Aston Villa.) They have been as high as 10th in the table this season, but as low as 19th. this photograph. Photo: Daily Mail. Arsenal picked up only one point from a possible six against West Brom last season. They were one of only three teams to pick up four points from Arsenal last year, the others being Tottenham and Newcastle. They were one of four teams to win the league match played at the Emirates. 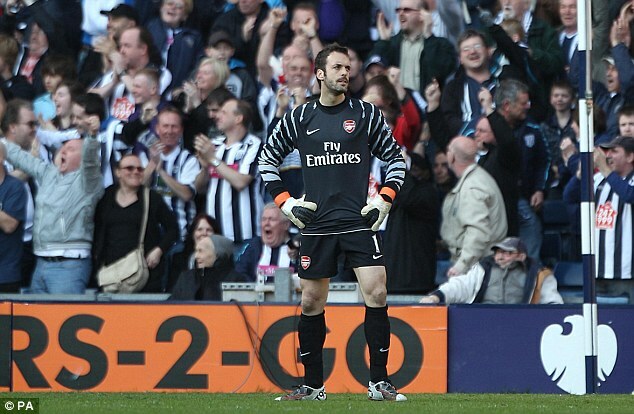 West Brom were one of only two teams to get the benefit of facing Arsenal with Manuel Almunia in goal in both league matches (the other was Blackburn.) In the first meeting at the Emirates, Almunia conceded a penalty (which he saved), but was then dreadful in the second half (as, quite honestly, the rest of the team was.) West Brom went up 3-0 before Samir Nasri pinged two back, but Tomas Rosicky's equalizing effort in the dying seconds of injury time flew over the crossbar and the Baggies won. At the Hawthorns in March, Almunia's hesitance on the line from a corner kick gave West Brom an early goal, then in the second half, they went up 2-0 when the Spanish goalkeeper found himself wandering miles outside of the box, collided with Sebastien Squillaci while trying to get the ball, and West Brom had an open net. 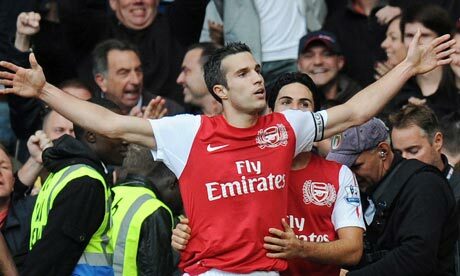 Arsenal came back and equalized through goals from Andrei Arshavin and Robin van Persie, whose shot rolled maddeningly slowly across the line. The year before last, West Brom was in the Championship, but played at the Emirates in the third round of the Carling Cup, with Arsenal winning 2-0. That, at the time, marked five straight Arsenal wins over Albion. last November at Blackpool. Photo: Sulekha. The referee is Northumberland-based Michael Oliver. Oliver, just 26 years of age, became the youngest referee to take charge of a Premier League match in 2010. He worked two Arsenal matches last season, and on both occasions, he made numerous dubious decisions, and Arsenal lost both. Even with this summer's promotions, Oliver is still the youngest Select Group official. The oldest, Peter Walton, is this match's fourth official. Oliver took charge of this fixture last year, which, as mentioned above, was a poor showing from Arsenal and a 3-2 loss. The other loss was 2-1 to Aston Villa in the final home game of last year. As for Oliver's showing in that match, I'll quote our recap writer, Sean Swift: "Mostly, I just feel bad for the guy - it's got to be a horrible and lonely feeling to be so overmatched and so out of one's depth in a highly visible situation." As for other West Brom matches, the Baggies were once down to nine men in half an hour with Oliver in the middle, in what would go on to be a 2-1 loss at Blackpool. One of those red cards was rescinded on appeal. He also worked their 1-1 draw at Stoke last year. this weekend, and will use it through the end of February. I don't know exactly how many people are involved with deciding which matches get televised in England and which matches get placed in the 3:00 p.m. non-televised slot, but I honestly have no idea what the hell happened with them this week. Arsenal find themselves playing at the same time as Chelsea, Manchester United, and Liverpool this week, and the result is a lack of live television coverage in the United States. Fox Soccer will stream the match live online, if you have a subscription. If not, it's on tape delay at 6:00 Eastern time on FSC. Newcastle v. Everton is the early match. Stunningly, Newcastle are unbeaten in the league this year, and after beating Stoke this Monday, they now sit third in the table. Third. Newcastle. Really. Let's see where they are by mid-December, after they play three straight league fixtures against City, United, and Chelsea. The late match sees QPR host City at Loftus Road. As for the five matches played at 11:00 here on the East coast (it's 11 this week, because England has changed their clocks already.) Aside from Arsenal v. West Brom, Chelsea is at Blackburn Rovers, United hosts Sunderland, Liverpool hosts Swansea, and Aston Villa welcomes Norwich to Villa Park. On Sunday, matches are back to normal times, as the U.S. will change their clocks that morning. Wolves host Wigan in the early match (really, Sky picked that game too?) while Bolton then hosts Stoke, and the London derby of Fulham v. Tottenham closes out the weekend.